While household debt outstrips incomes across the country, is the UK unusual among its peers? UK households are currently indebted to the tune of around 135% of annual incomes, a level of debt which has the potential to accelerate and amplify shocks through the economic and financial systems, if there were to be a sharp rise in interest rates. An interest rate hike is usually the result of a rise in inflation, which can be caused by a number of different events or economic pressures. The most likely spark for a more inflationary environment in the UK currently is Brexit, where if no deal is reached the Bank of England is predicting a sharply lower sterling and therefore higher inflation. To put the UK’s position into perspective, the graph below shows the UK in comparison to its US counterparts. 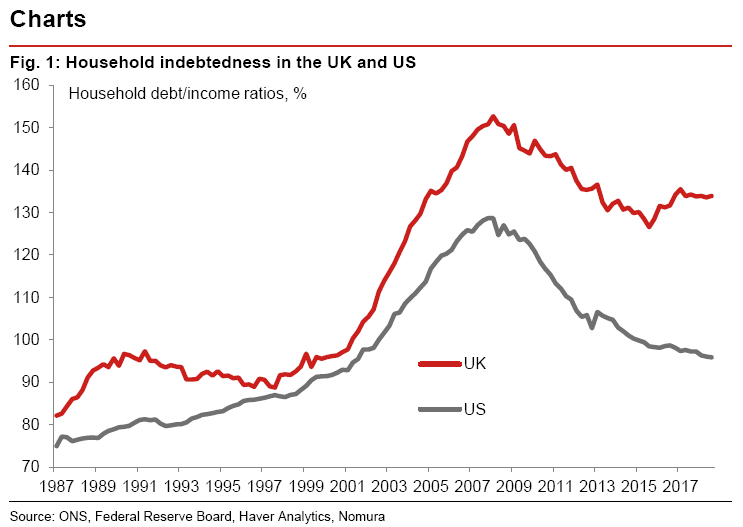 Household indebtedness has been on a rollercoaster ride over the last 30 years in both the UK and the US. The booms in the housing market in the late 1980s, and especially in the 2000s, have left UK households far more indebted than their American cousins. For example, in the late 1990s UK and US households had debt levels similar to one another at just under 100% of aggregate incomes. While the US is not far above those levels right now and the UK remains much higher. This appears to paint a fairly bleak picture for the outlook of the UK’s housing market and you may ask how the UK got there? The declining trend in interest rates over that period can explain rising debt levels. After all, lower interest rates should raise house (asset) prices, and therefore debt levels, to such an extent that measures of affordability – such as repayment-to-income ratios – remain static. This is broadly what has happened in the UK, where repayment-to-income ratios are now close to their long-term average. However, relative to its peer group and with more of a global outlook the UK is around the middle of the pack (see figure 2). Households in the Nordic countries tending to be the most indebted (Danish households on average owe a staggering 260% of their incomes), while households in Italy, Germany, and the US are the least indebted. Country divergences in indebtedness don’t always relate to homeownership. In some cases (such as Norway) high rates of home ownership might explain high household debt, but Denmark (a country with a sub-average home-ownership rate) has one of the world’s highest household debt ratios, while Italy (a country with above-average home ownership) has the lowest levels of household debt relative to its peer group. 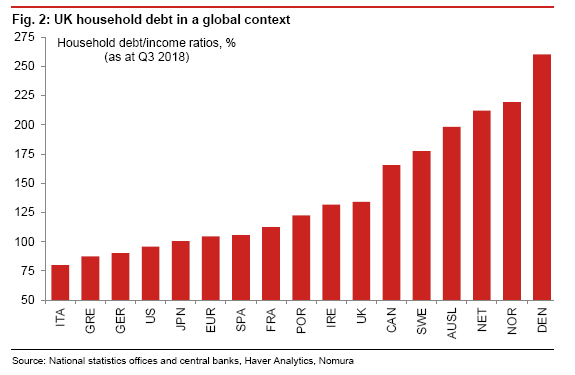 In summary, although the UK is almost smack in the middle of the pack with regards to the average global household debt, vulnerability to external shocks as a result of Brexit is cause for concern. The repercussions of such an event could cause a rise in inflation and therefore interest rates, leading to a potential correction in the housing market and the inability for individuals to meet their debt obligations. The UK in 2019: Why are global investors optimistic about the UK?